Leaf-feeding insects can have significant negative effect on the yield of short-rotation coppice willow. Partial defoliation, as occurs with beetle feeding, is the most common problem and is usually due to both generalists that can feed on a range of hosts, such as the Japanese beetle (Popillia japonica Newman) and specialists that are host-specific, such as Chrysomelid beetles, including Phratora vitellinae and Phratora vulgatissima (brassy and blue willow beetles) in the UK and Plagiodera versicolor (imported willow beetle) in the United States. 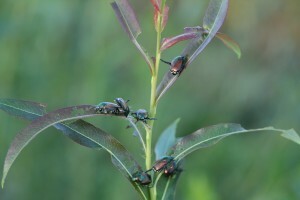 Leaf-sucking insects, such as the potato leaf hopper (Empoasca fabae), and stem-sucking insects, such as the giant willow aphid (Tuberolachnus salignus)and the black willow aphid (Pterocomma salicis), can also debilitate fast-growing willows. Potato leaf hoppers extract plant sap directly from the leaf veins and simultaneously inject a toxin that causes injury to the plant. The dual effect of feeding and toxin causes a complex of symptoms known as “hopperburn”. Leaf curling is the most obvious symptom and is usually accompanied by reduced growth. Salix viminalis and S. viminalis hybrids are highly susceptible to potato leafhopper and more resistant varieties often display leaf curl with minor growth reduction. Willow sawfly (Nematus ventralis) is also a common, periodic pest on willows and poplars in North America, Europe, South American and Australia. Sawfly larvae look like caterpillars, but are actually a non-stinging member of the wasp family. The larvae feed on young tender leaves leaving only the midrib of each leaf. Occasional dramatic defoliation events can strip an entire plant. While this could be debilitating to a young plant, it is not usually a major problem for mature plants. 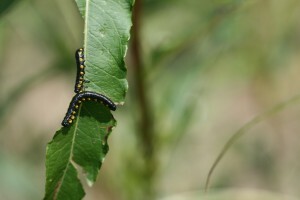 Other minor pests include stem borers such as the willow stem sawfly (Janus abbreviates) that lays its eggs in willow stems. As the larvae develop, they tunnel down and eventually bore out of the stem. The net effect is death of the individual stem above the exit of the larvae. In collaboration with George Hudler’s lab, we have begun to identify microbes that cause disease on willow in the United States. Shawn Kenaley has collected and begun analyzing samples of diseased leaves and stems, and we have been surveying for disease symptoms in replicated trials across the Northeast since 2005. Rust is one of the most damaging diseases of shrub willow. The majority of rusts that infect willow have been identified as Melampsora epitea and M. paradoxa. 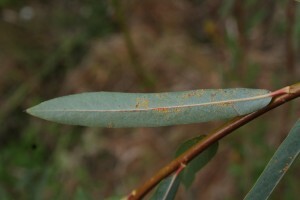 Rust appears as small (1-2 mm), orange or brown, slightly raised pustules of teliospores on the surface of the leaf. They usually complete a complex sexual life cycle that involves an alternate host, such as larch, fir, or saxifrages. Rust populations multiply through infection and repeated re-infection of the leaf during the summer finally producing teliospores that overwinter on the dead infected leaves in the litter. With the onset of severe infections, rust defoliates the plant prematurely and reduces yield significantly. Moist, cool summers and mild, temperate winters are ideal environmental conditions for Melampsora growth. Such conditions are often found in Northern Ireland, England and Sweden where rust has proven to be a major problem in willow plantations. Furthermore, rust infections can predispose a plant to infection by secondary pathogens, which may lead to further reductions in yield or premature death. Species used in bioenergy plantations that display particular susceptibility to rust include S. burjatica and S. viminalis in Europe and S. eriocephala in North America. Resistance to willow rust is under strong genetic control, therefore selection and breeding programs in Europe and the United States emphasize rust resistance as the primary management for this disease. In Northern Ireland, planting shrub willow in mixed-culture stands has effectively reduced inocula and has proven to be an effective method of non-fungicide control of rust disease. The physical barrier provided by resistant varieties limits the movement of the inocula and slows the buildup, often delaying the onset of disease. This strategy has successfully slowed the spread of disease and reduced the impact of rust overall on willow plantations. Willow scab, caused by the fungus Venturia saliciperda affects Salix species throughout Europe and the eastern United States. The scab appears as small olive-brown masses on infected leaves, petioles, and/or twigs following wet weather (April-August). In plantations, willow scab causes only slight damage to current season’s shoots and leaves. However, when heavy infections repeatedly occur over a period of years, the disease can reduce growth and vigor, resulting in twig or branch dieback and predisposing the plants to insects, other pathogens, and drought stress. Willow scab is widespread throughout New England and New York State. The disease also occurs in Pennsylvania, New Jersey, North Carolina, and Washington State. Most species of indigenous and naturalized Salix species are susceptible and several willow species used in bioenergy production, S. eriocephala, S. purpurea, S. miyabeana, and hybrid-progeny of S. purpurea and S. miyabeana are confirmed hosts. Black canker of willow is caused by the fungus Glomerella miyabeana (Glomerellaceae). In North America and Europe, the black canker pathogen is consistently associated with the willow scab fungus and together they combine to produce a serious disease of willow known as “willow blight”. In the late spring and early summer (April-June) brown to black lesions appear on leaves and twigs affected previously by the willow scab fungus. Infected leaves usually shrivel and die as the fungus grows rapidly from the leaf blade to the petiole, then into the twig forming a canker. Cankers may remain localized at the point of infection or expand and encircle the twig. In willow plantations of New York State, the occurrence of black canker disease appears to be rare and has only been found affecting hybrids of S. viminalis and S. miyabeana. Other diseases, such as crown gall disease caused by Agrobacterium tumefaciens, anthracnose tip blight caused by Colletotrichum spp., and cankers caused by Dothiorella spp., Botryosphaeria dothidea, Cytospora spp.,and Leucostoma spp. have not had broad impact on bioenergy plantation yield, but may reduce cutting yield in nursery plantations. These slow-growing diseases localized to the upper portions of stems are regularly removed by harvest on a short rotation. As long as stem canker or tip dieback diseases do not penetrate into the stool, they typically have only a minor impact, since buds just below the affected area will rapidly break dormancy and emerge to continue growing.